NEW YORK (CNNMoney) -- OK, bookworms, now you can declare Armageddon: Kindle e-books have overtaken paperback books as the bestselling type of content in Amazon's bookstore. 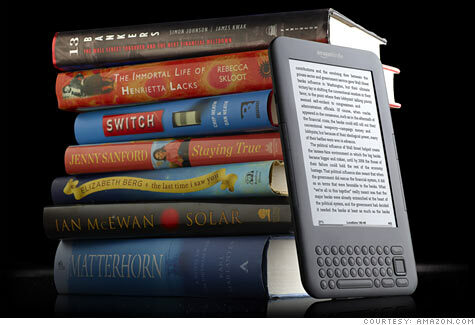 Amazon made waves when it announced in July that Kindle content was outselling hardcover books. But industry analysts quickly dismissed that milestone, pointing out that paperback books sell far more copies than pricier hardcovers. E-books have now vanquished their paperback rivals as well. "This milestone has come even sooner than we expected -- and it's on top of continued growth in paperback sales," Amazon CEO Jeff Bezos said in a prepared statement. In fact, for every 100 paperback books sold, Amazon has sold 115 Kindle books since the beginning of the year, the company said. Amazon reported record quarterly sales of $13 billion for the three months that ended Dec. 31, up 36% compared to last year. Earnings also topped Wall Street's estimates, with net income of $416 million, or 91 cents a share. Analysts polled by Thomson Reuters were looking for 88 cents a share on $13 billion in revenue. Sales in the Canada and the United States jumped almost 50% from a year ago, while international sales climbed 26%. Though the results were solid, investors were rattled by the online retailer's guidance for the current quarter. Amazon expects sales to come in between $9.1 billion and $9.9 billion, but it anticipates that its operating income will decline. It set a very wide range for its forecast, saying it expects operating income of $260 million to $385 million -- which would be down a mild 2% or a whopping 34% compared to last year. Shares of Amazon (AMZN, Fortune 500) tumbled almost 9% in after-hours trading, after rising more than 5% during the market's open. Amazon has never revealed sales figures for the Kindle. Price cuts late last year brought the most basic version down to $139, and Kindle apps are now available for a wide variety of devices -- including the iPhone, iPad as well as BlackBerry and Android phones. Beyond the Kindle, other dedicated e-readers include the Barnes & Noble (BKS, Fortune 500) Nook, the Sony (SNY) Reader, and Borders' Kobo. -CNNMoney staff reporter Hibah Yousuf contributed to this report.